I’ve had the Marin Four Corners for about 3 months now but i havent had a chance to tour with it. Recently, a couple of friends and i had a short multiday trip up north and used this bike for that purpose. For starters, the Marin Four Corners (check the specs here https://www.marinbikes.com/bikes/2019-pavement-drop-bar-utilitour-four-corners) was designed for bikepacking expeditions. In terms of the ride, the Marin four corners reminded me of the Surly Disc Trucker on 650b wheels-slow yet the low bb height and chainstay length gave you sure footed stability during climbs. While i haven’t loaded this much as i packed light during the tour, i felt that the bike has a livelier feel when loaded with racks and panniers. With regard to gearing, i felt that this was adequate giving a wide range of gear ratios, the 3×9 sora can definitely be a good option for long haul touring. while it is the first time ive used TRP mech brakes, there’s nothing really special about them. it does the stopping with fine modulation. One of the interesting things about the stock build is the compact 12 degree flared drops which to me were comfortable despite the sizing (mine had 40mm width). It reminded me of the soma condor in terms of comfort as you would prefer to stay on the drops while cruising. While the recent trip ive had gave me an idea of the comfort and adequacy of the Marin four corners for touring, what i look forward doing with this bike is some off road expeditions as well as loaded trips using racks/panniers. Overall, similar to the Marin Pine mountain, the Four corners’ specs are value for money for a built bike which may appeal to those interested in starting their own expeditions on two wheels without breaking the bank. Historically, the Philippines has been instrumental in the Second World War due to its strategic location for the western allies. Corregidor island is one of those sites that has not only been used by the American and Filipino forces to defend the country, but is a historically rich island filled with stories of valour and hardship. Converted into a tourist destination, I’ve heard stories from friends that Corregidor Island offers bikers a chance to go and experience history on two wheels. Leaving early morning from the Seaside terminal near Mall of Asia, the ferry trip lasted about 2 hours. Once we got to Corregidor, our guide met us and gave us an orientation on what to expect during the tour. From different military buildings established by the Americans, to heavy cannons, the spooky tunnel to a Japanese memorial and the local museum, Corregidor island has everything to offer for the history buff. Aside from great sites, the ride is pretty straightforward-a climb here and there, a nice view of the beach and plenty of scenery! We opted to stay for the night and had a good time going around the island the next morning. 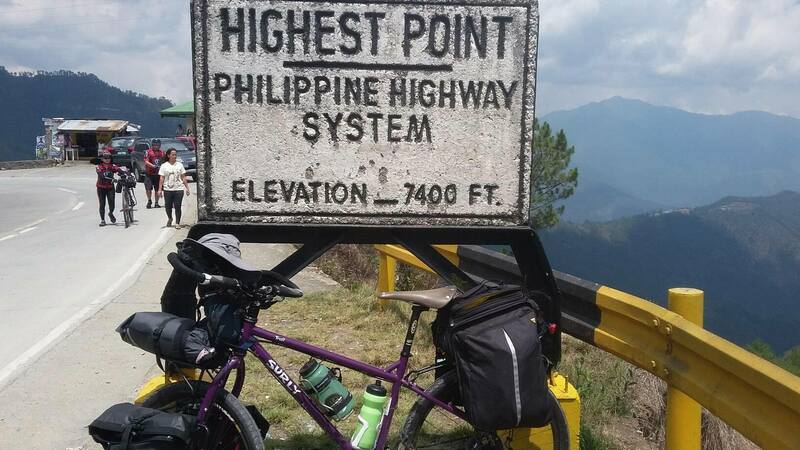 Overall, the Corregidor biketour is an ideal itinerary for those intending to do relaxing cycling trips in preparation for longer biketours. The ferrytrip costs Php 2000. this includes the roundtrip fare, bike stowage fees (the staff will load your bikes), buffet lunch and guide (it’s advised to give a tip to your guide after the tour). It is also advised to book your tickets early as ferries that shuttle from Manila to Corregidor have a limit on the number of bikes allowed on the cargo. Also, you’ll need to fill out a waiver and bring the necessary gear (helmet, tools etc before loading). Sun Cruises can also help you with reservations in the hostel (good for 25 people). the hostel charges Php500 per person for overnight stay. The hostel is quite basic, a large air-conditioned room, with plenty of double deck beds, a shared bath, and drinking water dispenser is provided.